Fragrant. 4 to 6 Feet. July / August flowering. Smaller, recurved, deep red flowers with white edges. 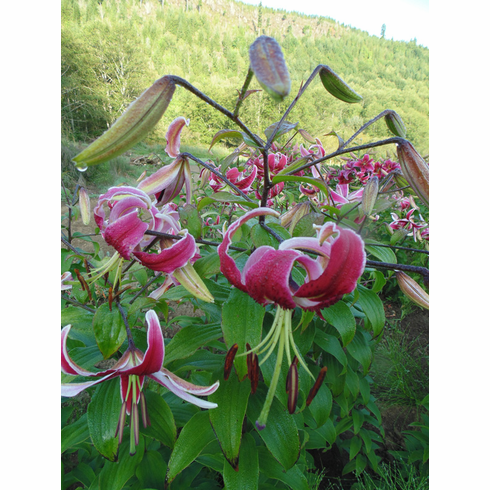 A nearly indestructible lily; reported to be bred from Lilium speciosum, Oriental, and Trumpet pollen, with the possible inclusion of L. henryi. 'Black Beauty' ranks high in the North American Lily Society's "Hall of Fame" for long-lived dependability in just about every area. Light scent. 4 to 6 Feet. Late July / Early August Flowering. Light Fragrance. 'Black Beauty' was the first of the 'Orienpet' type lilies. When Leslie Woodriff introduced this crowing achievement of his lifelong work, he broke the mold of thinking for what was possible in the breeding of lilies. Editorial Note: The most colorful person in our life with lilies, and a friend we truly cherished, was Leslie Woodriff and unfortunately, we did not meet Leslie until he was in his declining years. Our first trip to McKinleyville, California some 600 miles distance was filled with excitement and anticipation. Not only was this an invited visit to meet a legend in lily breeding, the creator of 'Star Gazer', we were meeting a man considered by many, especially in Holland, to be the father of the Oriental Hybrid. This was but the first of what became an annual trip for us. Pulling up in front of his house, we were enthusiastically greeted by Winkey, his daughter, who said "Dad has been waiting to meet you" and she led us to the row of wood framed greenhouses that had seen better days. Instructing our two boys to wait outside, we entered what could only be described as a jungle. Potted lilies and begonia's everywhere with not an empty space on the benches or the floors to be found. To walk between the benches also meant holding back plants so as not to step on them while also keeping an eye for those pots hanging from the rafters. Then all of a sudden, out of the undergrowth, emerged Leslie with a smile bigger than life. We found it a struggle trying to keep up with Leslie even though he was walking with the support of two canes while we all weaved our way through this primeval jungle. What was so fascinating on this first visit to us was that Leslie had pockets full of match boxes all containing mixes of pollen. Whereas we could see no markings to identify what was what, Leslie would stop from time to time, pull out several matchboxes, select the one he wanted and make a cross without missing a beat or there being a break in the conversation. After relating that meeting to another well known breeder, we found with surprise that this person looked down upon Leslie as being little more than a crackpot or an old coot that in their words "knew nothing" about lilies. What Leslie forgot in his lifetime though is more than that breeder has ever learn in theirs. He was looked down upon by this person as he did not keep paper records, this genius of a man kept it all in his head and I truly believe he remembered the parents of every cross he ever made all the way back to his very first. We later chalked it up to simple jealousy. Our fondest memory of Leslie? On each and every visit, the same story was related whenever we came upon 'Black Beauty'. Keeping in mind this was during the 1980's and at the height of the Cold War, Leslie would always stop and say, pointing with his cane, "You know Bob and Dianna, they say if there is a nuclear war, only cockroaches and rats will survive. MY 'Black Beauty' will be there through for them to look at". Leslie's life ended in poverty. A man who one Dutch acquaintance told us was looked upon in Holland as almost a god, as with LeVern Friemann whom he shared genetic material and knowledge with, Leslie was a breeder and lover of his plants. As such, as with LeVern, he was taken advantage of but never lost his love of life nor his zeal to share his love for lilies with others. And of that first visit with Leslie combined with taking our boys on a week long camping trip to Mt. Lassen National Park? Each stop, we unloaded 6 potted lilies, purchased from Leslie, all in full bloom and set them around our tent so as to make sure they got enough light. Yes, a few people asked about them, but most campers only looked on in curiosity wonderment.